According to the United Nations, the majority of the world’s population today live in cities. Out of a world population of 7 billion, 1 billion people live in slums and more than 1 billion are informal workers, struggling to survive. These figures are staggering if you consider that 95% of the future growth of humanity will occur in cities, overwhelmingly in poor cities, and most of it in slums, creating a crisis for this global urban, informal working class, or mass unemployed people – especially, but not only, in the developing world – who have no formal connection to the world economy, and no chance of ever having such a connection. Inexorable forces are expelling people from rural areas, most of whom migrate to urban slums on the peripheries of cities. magnitude of this movement – is how it is driven not by industrialisation or even economic growth but by sheer desperation. Recent studies (for example, The Challenge of Slums by UNHabitat and Planet of Slums by Mike Davis) have alerted us to the fact that the global urban unemployment crisis is as serious a threat as climate change to our collective future. They have sounded an authoritative warning about the worldwide catastrophe of urban poverty. The informal proletariat constitutes the fastest-growing social class on earth, the truly ‘excluded’. This phenomenon, which has been driven by neo-liberal economic policies and a thoroughgoing retreat of the state, clearly deserves more attention than it is getting from urban planners, sociologists, environmentalists, epidemiologists and demographers. urbanisation has been disconnected from industrialisation and even from economic growth. attempt to capture the variety of responses to this environment. of more radical answers. Are these urban slums volcanoes waiting to erupt? As unappealing as this might be to public taste this is nevertheless the way I see these issues. It says a lot for David Lurie to have invited an architect and not an artist to open his fine exhibition. This is good since I feel very strongly that too much nonsense gets paraded around as so called art theory, post structuralism, neo liberalism, radical authoritarianism or whatever. Maybe an architect with no attachment to these arcane worlds of art theory can offer some good straight common sense observations – I hope. Unfortunately we are not immune in this country to being susceptible to all these so-called theories – invented by unemployable French philosophers. Anyhow I would like to start by making reference to Ludwig Wittgenstein whom some of you might know was a wannabee architect and in fact designed a fine house for his sister in Vienna with the help of Adolf Loos. Anyhow Wittgenstein said that the difference between a good and a bad architect and here I would paraphrase, an artist, is that the bad architect/ artist succumbs to every temptation placed in his/her path. This is very true about the world we live in today of unlimited access to information devoured uncritically by all of us. It is in opposition to this crude consumption of images – the triumph of the visual over all other senses that David’s work finds resonance. David has chosen as his subject matter the people who live in the so-called informal sector beyond the control of state taxes and licenses. These people paradoxically comprise more that 70 per cent of our urban populations in South Africa. These people exhibit in my terms extraordinary resilience and creativity in managing to survive under the most difficult circumstances. They build homes for themselves which they make for themselves without any recourse to the state, the banks or any other formal sector institution. They make homes that exhibit extraordinary variety in which each home is shaped in accordance with the family’s needs, in which no two homes are similar and in which the most extraordinary generosity is extended to neighbors where boundaries and public space need to be negotiated. These people and their homes are the subject of David’s exhibition. 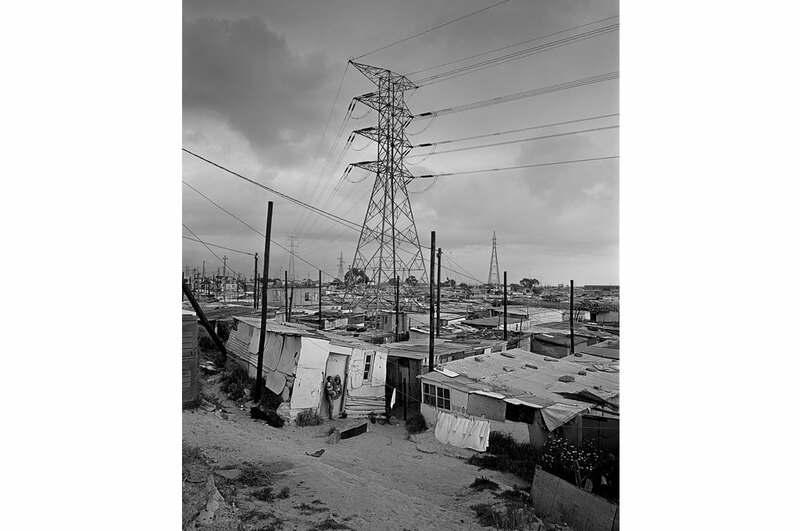 The fact that he has chosen to spend time photographing these settlements says a huge amount for the sensibility that David as an artist brings to bear in negotiating the difficult terrain of South Africa. I love the triptych that he has made of the homes in Hangberg , a neighborhood that I know well. His photographs tell you eloquently all that you need to know about this settlement – the care and attention to the construction of the home – the consideration of the neighbors in ensuring that one does not obscure views or take away from the neighbor the amenity that you might enjoy. Look at the images and you will see what I mean. What interests me is the proposition offered by these images that maybe we got it all wrong and that the best way to live in this world is to live in a way in which one can control the decisions concerning the provision of the basic necessities of life. These families have nothing other than the single most plentiful renewable energy resource in the world namely human labor, imagination, ingenity and creativity to offer. These are the energy forces that make these settlement, not banks or pension funds or bureaucracies. And look at David’s photographs. They tell the full story. Here you have a community of people living side by side in relative peace without having to resort to laws to regulate what you can build. They build resourcefully – all the materials are recycled and not one single cent of taxes goes to the cost of the houses. And look at the quality – is it not better than the awful RDP houses constructed by the state at huge cost to us all. So in conclusion thank god for David and his searching eye – his ability to reveal aspects of our world to us which would otherwise remain unseen. And most wonderfully he does it with great style and a wonderful eye.